Sun-drenched and lush, Skiáthos was the first of the Sporades Islands to be developed, (in the 60s), and is surrounded by a ring of lovely beaches and a clear-as-crystal turquoise sea. The majority of the best places to stay in Skiáthos are close to these idyllic spots. The north coast of Skiáthos is less accessible than the south coast, which is where you’ll find more of the island’s resorts. But, if you’re here to hike or to find a quiet, secluded spot, then the north is where you’ll find the best places to stay on Skiáthos for you - in isolated spots surrounded by olive groves and protected from view by green hills and deep bays. Skiáthos Town is less than a mile from the airport, so most visitors will at least pass through. There are a lot of older resorts and hotels here, but if you head up the hill behind the old port you'll find the charming streets of what remained of the old town after WW2. There are also some lovely churches and gardens. Skiáthos Town is definitely the best place to stay on Skiáthos if you fancy a bit of a dance in the evening and some nightlife in general! A couple of miles out of town is Skiáthos's main monastery, Evangelistrias, now also a museum, and a good place to visit if you're interested in finding out more about the island. Another good place to explore is the island's old capital: pirate-resistant Kastro. Its major fortifications date from the 16th century, but by mid way through the 19th it had been abandoned for Skiáthos Town. So it's now an eerie ruin. You can take a day trip to Kastro on one of the boat tours which circumnavigate the island, stopping off at some of the loveliest beaches inaccessible by land, and often some interesting sea-caves. The lovely Monastero di Panagia Evangelistria, which has a little museum (home to the loom which produced the first ever Greek flag!) and a gift shop selling a variety of home produced liqueurs, honeys and olive oils. Plus, you'll love the splendid views from this tranquil spot. Be sure to visit Il Kastro, the ruins of what was once the Byzantine capital of the island. Located on the top of the island far from the hustle and bustle, you can marvel at the breathtaking views all around once you reach the top and meander through the narrow ancient pathways which are still intact. The Blue House Art Gallery (not so much a gallery as a shop), sells a variety of gorgeous jewellery made from precious local metals and stones as well as an array of traditional Greek artefacts. Be warned though - if you visit once, you'll want to go back again and again! Skiáthos is busy in the height of summer, and prices reflect this. 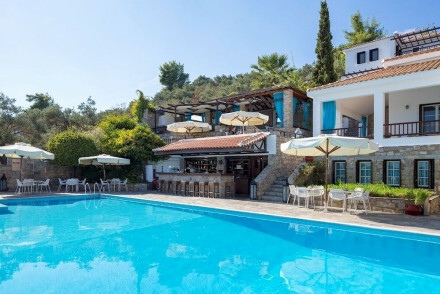 The island's population is about six thousand, but leaps to nearer seventy thousand during July and August, and the best places to stay in Skiathos will be very difficult to book. So either reserve your room well ahead, or come in the shoulder season when the weather is still warm, but the crowds have gone. One of our favourite properties on the island is bang in the centre of Skiáthos Town. 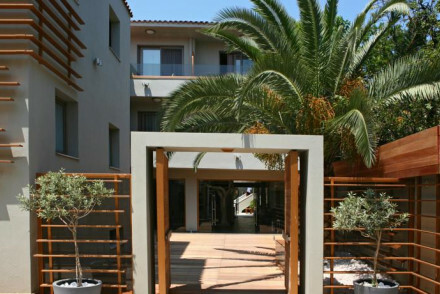 The Bourtzi Boutique Hotel has 38 simple, contemporary rooms in a fantastic location with easy access to the beach. There’s also a pool and a lively bar. But for something special try the Aegean Suites, a five star property nestled in amongst olive groves and a lush garden with sea views. The decor is neutral and beautifully cool, it’s possible to book a room with a private hot tub and there’s gourmet cuisine available in the evenings. Whilst it's temperate year-round, Skiáthos is obviously nicest in the summer months - with July experiencing an average of 26°C. That said, this is peak tourist season and so expect to pay more for accommodation than at other times of year. International visitors can fly to Skiáthos Airport, however it is not served by any direct flights from the UK and so you'll usually need to change planes in Athens. Once at the airport, you can take a taxi to your destination. There is a mini-bus route (the blue line) which goes from Skiáthos Town to the airport, but this is fairly irregular. 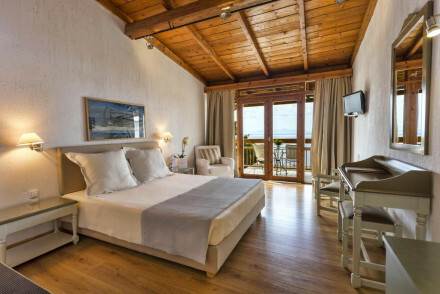 Still not sure which is the best place to stay on Skiáthos for you? Expand your search to include all the best places to stay in the Sporades Islands. 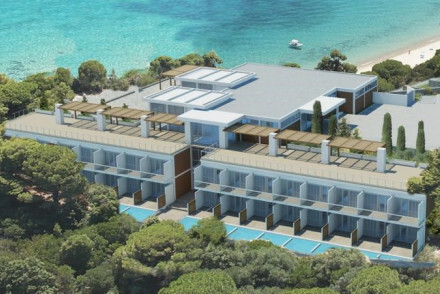 Chic accommodation boasting an enviable location overlooking the sea. Rooms are simply designed, yet stylish; think polished wooden floors, light hues and modern bathrooms. The restaurant serves Greek dishes with touches of Mediterranean cuisine and there's a glorious infinity pool. Beach Life - Spend a day at the beach partaking in a whole host of watersports: water-skiing, snorkelling, windsurfing or scuba-diving. Weddings - Pefect for small and intimate weddings. There are in-house wedding planners who can help organise your special day. Active Holiday - Rent a bike, car or motorbike at reception and explore the chapels and villages that line the island. Spa breaks - Spend an hour with the in-house masseuse and unwind against a backdrop of the turquoise Aegean sea.